Ditch the modern world for a couple of hours and come back to this day in 1983 for another edition of Off The Chart! 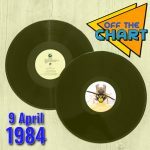 We’ve got the usual mix of forgotten and half-remembered hits, three tracks from one of the week’s biggest albums, a look at the day’s events, a quick squint at the Swiss singles chart and the UK’s top five singles in full. Whose chart career was coming to an end after almost twenty years? Which legendary comic duo was co-opted into a song about road safety? And who charted with an unrecognisable reggae version of a rock ‘n’ roll classic? Tune in and find out!